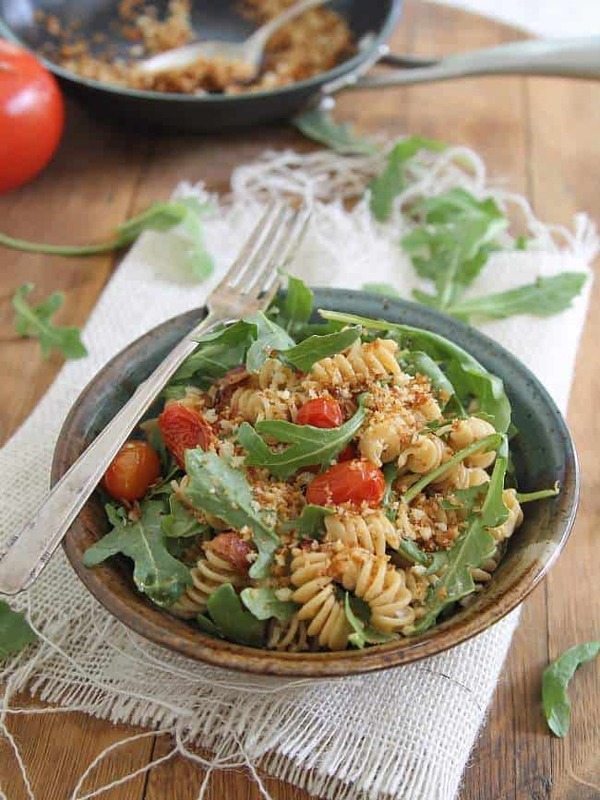 This cream cheese BLT pasta salad is topped with garlic butter breadcrumbs. The first year we lived in this house, I got all ambitious and planted four huge pots with tomato plants. While we have a deck, it faces north and really doesn’t get great exposure for tomato plants so I kept them in the front of the house near the porch. I can vividly remember walking outside to go to work one morning in late July and seeing them chomped down to nearly 1/4 of their size, all the juuuuust about ready to be picked tomatoes completely gone. I mean, I knew there were deer around, I just didn’t realize they’d be so brave to literally come up on my porch and have a midnight feast on my tomato plants. I’ve gotten a lot smarter since then and moved anything edible in pots to a safer place or literally barricaded my front steps at times overnight to keep them from it. But this year, we have two babies literally living (like they bed down at night and in the morning I see them sleeping there) in our bed in the backyard between this huge rock, an equally huge hydrangea and some decorative grass and it’s the cutest thing I’ve ever seen. So while I’ve let them go to town on the lilies and hydrangea back there and sacrificed all the pretty flowers on those, I’ve remained firm on the tomato plants. Sorry, guys that’s where I draw the line. The plants I have this year are seedlings that came back up in my mom’s garden from last year, were transplanted from her garden to two pots and then divided into four pots once I got them home. That’s way too much work for anyone to ruin, even cute little Bambi in the backyard. And now that they’re all starting to multiply and ripen like crazy, friends and family can rest assured they’ll be seeing lots of this cream cheese BLT pasta salad appearing at all BBQs from now until October. 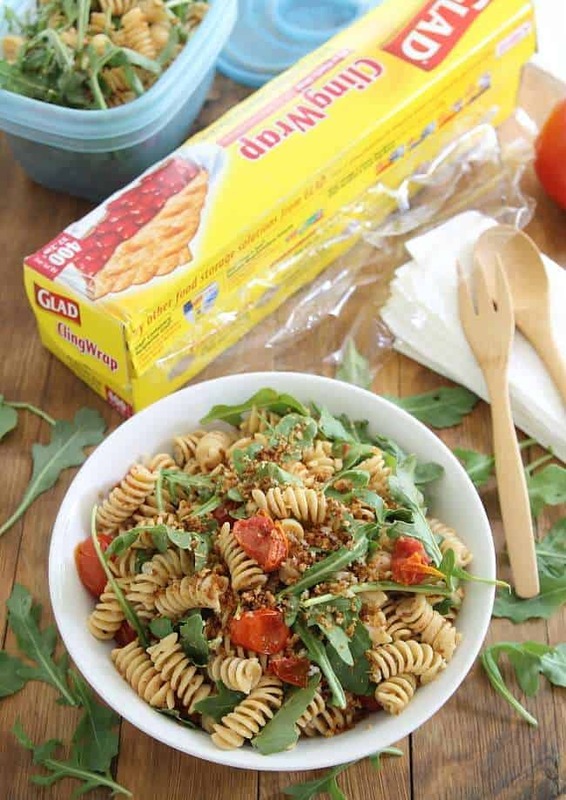 The best thing about pasta salad (besides a great way to use copious amounts of tomatoes) is how easy it is to prep and store ahead of time and how well it travels. This salad can definitely be made the day before and kept fresh in its serving bowl with some Glad Cling Wrap in the fridge or divided up into portable GladWare once it’s cooled for travel the next day. Toss the tomatoes with the olive oil, salt and pepper and spread out onto a baking sheet. Roast for about 20 minutes until they start to "pop" and shrivel. Remove from oven and set aside. Meanwhile, bring a large pot of water to a boil. Once boiling, add pasta and cook until al dente. Drain and return to the pot. Add the cream cheese and stir with a spatula until fully coating the pasta and completely melted. Add the roasted tomatoes, bacon and arugula to the pot and gently toss to combine. Heat a small skillet over medium. Add the butter and garlic and let cook for about 1 minute until fragrant. Add the breadcrumbs and stir frequently with a spatula coating in the butter and garlic until they turn golden brown, about 3-5 minutes, careful not to burn. 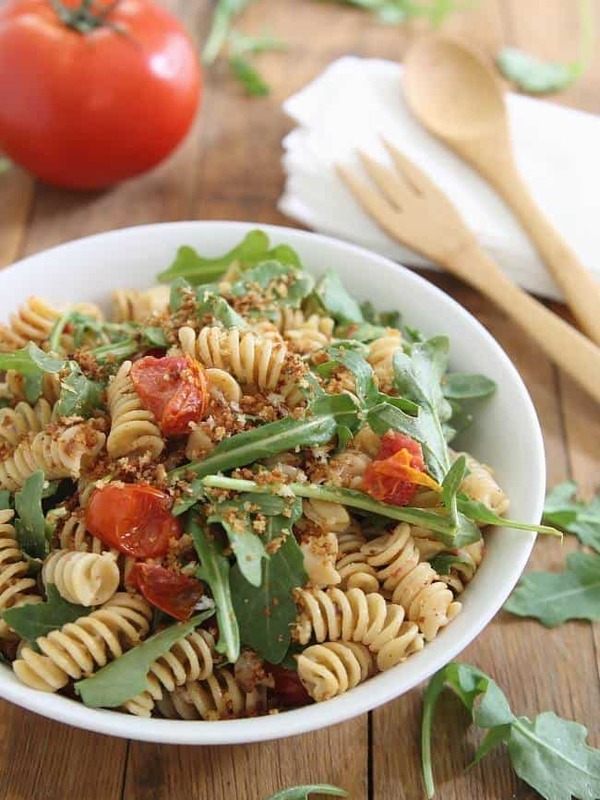 Remove from the heat and top the pasta salad with the breadcrumbs. *This post is sponsored by Glad. All opinions and content are my own. Thanks for supporting the brands I choose to work with. That’s my fave kind of pasta…I swear that shape tastes better :) Pinned. And I am a clingwrap addict! MUST have! Such a pretty pasta salad! And I hear ya on the tomatoes, you much protect!!! !